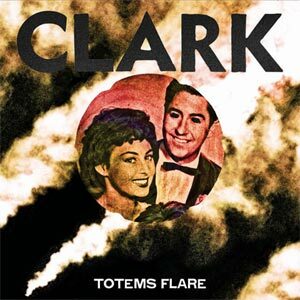 It is almost hard to believe that Clark only released his first album eight years ago so much has he become, in that time, one of the strongest, most consistent and emblematic artists on Warp, to the point of challenging the might of heavy weights like Aphex Twin or Squarepusher. His constant deliveries, started with Clarence Park, have since considerably grown in confidence and vision, and his unashamed use of heavily electronic sounds, at a time when others seemed to move away from those, has made him one of the finest purveyors of the genre. With Totems Flare, Clark’s follow up to last year’s Turning Dragon and his fifth full length, he continues to create strong and gritty electronic music, and he wastes no time showing off his latest dirty grooves with album opener Outside Plume and Growls Garden, the leading track to his recent EP. Although the latter feature vocals, albeit distorted and rendered incomprehensible for the best part, these two are utterly Clark in every way. But, as soon as Rainbow Voodoo kicks off, at first showered by 8-bit video bleeps, before soon turning into an electro-punk assault, the album suddenly takes a different dimension. Clark once again lays vocals on the piece, and while this is not the first time he uses his voice on a record, there is here a move toward more structured song forms, at least for a moment. While his voice also appears later on Look Into The Heart Now, Talis and Suns Of Temper, it does so in much more processed fashion, echoing in that Growls Garden. Turning Dragon made a resolute push toward the dance floor, but with Totems Flare, Clark returns to slightly less straightforward forms. Of course, the beat is as important here as it has ever been on any of his records, but while tracks such as the acid-fuelled Look Into The Heart Now or Totem Crackerjack, with its bip-bop slant in the first part, then groovy electro in its second, certainly wouldn’t sound out of place in a club, the focus is once again more on the dense sonic spaces that Clark knows how to create so well. Later, on Future Daniel, Clark dispenses once again his trademark electro-grit and fat groove, but the drums at times evokes a more openly rock setting. On Primary Balloon Landing Clark uses heavily processed guitar sounds to create a muffled effect occasionally reminiscent of My Bloody Valentine, while a gentler and almost ethereal guitar motif on Absence brings this album to a somewhat unexpected close. While it continues to bind a wide range of electronic textures and ideas together, Totems Flare fails to entirely impress in the way its predecessors did. While it is difficult to pinpoint with precision where this album refuses gel quite so successfully, the use of heavily processed vocals, although working pretty well on Growls Garden or Talis, doesn’t quite feel so necessary elsewhere. There is also a slight feeling of complacency here, as if Clark had momentarily lost sight of his end goal and was left running around to find his way again. This is especially true on the over-charged Rainbow Voodoo, which bends under the pressure of its many components and ends up biting its own tail. But, while Totems Flare lacks the integrity Body Riddle or Turning Dragon, it remains a strong album, still very much driven by the same vision and energy.